This entry was posted in Beirut, expat life, Lebanon, tourism, travel and tagged Beirut, expat, Lebanon, safety, travel. I guess “expensive” would depend on your point of reference. It’s not cheap, that is for sure, but it is possible, as in many cities, to live cheaply or extravagantly, according to your budget. I find groceries more expensive than US/Europe, but not exorbitant, especially if you avoid imported products. Housing is definitely expensive, but not as much as say, New York. Enjoy your visit! Would you still say it’s safe to travel there? I want to go after the first of the year but like you stated the media blows up everything and the travel warnings online concern me also. Hi Ashley, yes, things are still stable here and personally I wouldn’t hesitate to book travel early in the next year. The big problem these days is what to do with the trash, which as annoying and awful as that is, it’s not something putting a visitor at some kind of personal risk. The travel warnings have been there the entire time I have been living here. There were a couple of months during the fall of 2013 that felt really unstable and tense, and I wouldn’t have recommended people visit at that time. But things have been calmer throughout 2015 than in 2013 and 2014 both. Well, I obviously spoke too soon because there was a bomb today in Beirut that killed at least 16 people. It seems to take much more than a bomb to destablize Lebanon, but it couldn’t hurt to wait a couple of weeks to actually buy your ticket. Thanks guys I was worried I need to visit Beriut in December 2015 to see my husband since he is still waiting for his visa since 2013 I need to be with him till immigration decides to give him a visa they let every one here with no problem but for good people like us poor him they are taking there sweet time to approve his visa thanks guys I will go and risk my life cause I know God will be with me and with all good people that has family in Beirut ..
Glad to hear that you will visit. Personally, I wouldn’t describe living or visiting here as “risking my life” – I have no interest in being a martyr, and if I felt my life or my kids’ life was at immediate risk, I would have left long ago. Sadly, as we see every day on the news, safety cannot be guaranteed anywhere – whether the risk is terrorism or from crazy guys with guns and a chip on their should (referring here to US shootings, not the Paris attacks which were clearly terrorism). Enjoy your trip! Good morning – and Thank you for your blog! We are living in New Orleans – and will be on a month long honeymoon through Hungary, Turkey Lebanon Jordan and Israel. 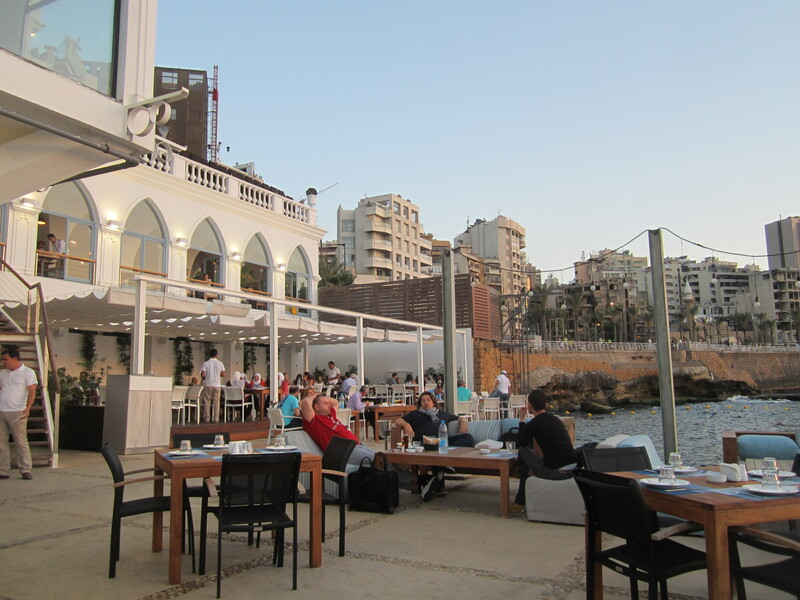 (June) Beirut is difficult to find much current travel info/reviews on – we are in our 40s – so all night party days are long gone – but seaside restaurants are right up our alley! can you give some sound advice on what neighborhoods to look to stay while in Beirut? Sounds like a great trip! Will you visit the countries in the order you mentioned? Sounds perfect. The restaurant in the picture is Sea Salt, at the beginning of the Corniche. Fantastic setting. Karam al Bahr at Zeitounay Bay has especially good seafood. Even if you don’t want all night partying, if you simply want easy access to bars and restaurants, then staying in Hamra or Mar Mikhael is convenient. Hamra has plenty of hotels at a variety of price points; in Mar Mikhael there is a nice B&B called Baffa House. For sightseeing the downtown area is a must-see of course, the National Museum is small but good, there are interesting art and design shops in Mar Mikhael, and Hamra is interesting to walk around. Take a day to head north of the city for the ruins of Byblos, and visit the beach either near Byblos or Batroun. Take another day to head to the hills, I suggest Deir el Qamar and Beiteddine Palace, with lunch at someplace nearby. Enjoy! I will be visiting my husband’s family in a couple days…I took some notes on the places you mentioned that would be nice to visit in/near Beirut. 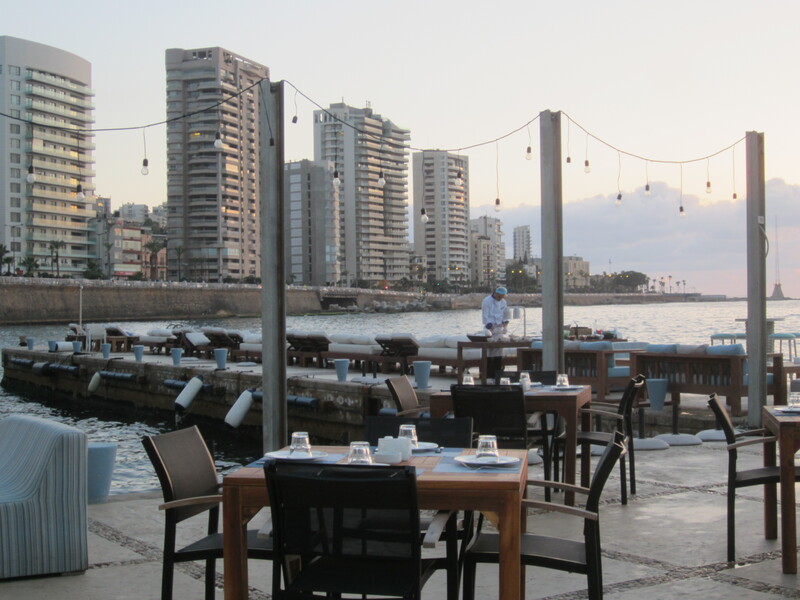 Will you place share your opinion of the Zouk Michael / St. Michael neighborhood of Beirut? In terms of safety, places to see, what to avoid…to advice would be so appreciated! thank you! Hello Sarah, I am sure you will have a great trip! Beirut is absolutely gorgeous right now with all the Christmas decorations everywhere. There is a Zouk Mikael which is a suburb of Beirut, about 15 mintues drive north of the city. It is charming and completely safe. THere is a renovated “souk” there with a few handicraft shops that is cute. But I wonder if you meant Mar Mikael (which translates to Saint Michael) which is a neighborhood within Beirut? That is the super-happening area with tons of little shops, restaurants and bars. Very lively, also totally safe, although if you are out at bars late at night I always watch my purse carefully (I think this is a good piece of advice just about anywhere). If you will have internet access on your phone, you can download this app http://mobile.zawarib.net/ which has locations of restaurants and shops – the paper version of this map is available as a free handout at many shops also. Be sure to stop by Plan Bey, Paper Cup and Artisan du Liban (the latter is located basically where Mar Mikael and Gemmayze meet). There are a lot of Christmas activities planned for the Beirut Souks downtown this weekend, and Byblos is super decorated for Christmas, so be sure to visit both. In terms of safety, the places to avoid are unlikely to be the ones that you would visit anyway. There are certain areas of Dahiyeh (the southern suburbs) that do have a greater risk of a bomb as they are areas targeted by ISIS. But that said, you’d also have to be really unlucky to be in the wrong place at the wrong time – there has only been that one bombing (Nov 12) in all of 2015. Have been looking at different areas of Beirut to those that you’ve mentioned (more ‘normal’ aread) to visit during a trip later this year. Can u tell me anything about the el nabaa neighbourhood? Hmmm, I wonder if you mean the Ras el Nabaa area? If so, it is a middle-class neighborhood near Sodeco Square, pretty centrally located. Not really any sights for tourists, maybe you will visit someone there? I have friends that live in that neighborhood, and I have always felt comfortable and safe there.